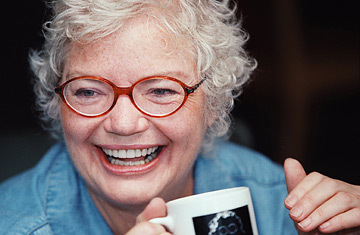 Molly Ivins died Wednesday, January 31, 2007, after a long battle with breast cancer. She was 62. There is a an old saying in Texas: "I wasn't born here, but I got here as fast as I could." Columnist and author Molly Ivins, who died Wednesday evening after a seven-year battle with inflammatory breast cancer, was one of the most notable transplanted Texans of recent years and, like her good friend the late Gov. Ann Richards, she came to embody a certain kind of Texas woman  passionate, funny, her wit folksy but sharp, sparing no one, not even herself. Having breast cancer, she wrote in a TIME column on Feb, 18, 2002, "is massive amounts of no fun. First, they multilate you; then they poison you; then they burn you. I have been on blind dates better than that." Ironically, she shared her transplanted Texas status with the man she dubbed "Shrub," President George W. Bush, whose affection for his adopted state no doubt matched Molly's. The two "vaguely knew" each other during their high school years through mutual friends in Houston's tony society. "He went to prep school back East and I went to prep school in Houston," Molly recalled. Born in Monterey, Calif., in 1944, Molly had moved back to Texas with her family as the war wound down and her father's military service ended. While he worked as a corporate attorney for an oil company, the family lived in River Oaks, Houston's top-flight neighborhood. Bush went on to conquer Texas politics, and by then Molly reigned as a major figure in Texas journalism. Eventually, of course, they were both more widely known beyond the Red River, but their journeys to the national stage were very different. While Bush came to embrace his political heritage, Molly veered from her own. Her family was Republican, but she was caught up in the turmoil of the '60s and became an ardent liberal, or "populist" as Texas liberals like to call themselves. "Molly was a hero," her beloved Texas Observer declared Wednesday evening in its annoucement of her death. "She was a mentor. She was a liberal. She was a patriot." After graduating from Smith (like her mother and grandmother) she went to Columbia School of Journalism and studied in France, working summers at the Houston Chronicle. Then a brief gig at the Minneapolis Tribune, followed by six years as co-editor of The Texas Observer with friend Kaye Northcott. The two cut a swath through Texas politics in grand Observer tradition, investigating and exposing misdeeds and championing causes. In person, the two looked nothing like a duo from central casting  Molly beyond six feet, with big hair and a wide laugh; Kaye, petite, tiny, birdlike  but both gritty journalists. In 1976, Molly was swept up by the New York Times to add some writing panache to the Grey Lady, but she brought more spice than the Times could handle. "Molly doesn't sand down," friend Adam Clymer said. Her legendary description of a community chicken killing event as a "gang pluck" was one wince too far for the Times, and she was back in Texas. That's where I remember her. In the decade of the '80s Austin was a grand place to be if you were a journalist or a politician. Texas politics was raucous and raw. There was booze, smoke-filled rooms (including Molly's office) and an abundance of colorful characters, some wearing diamonds in their cowboy boots, others brawling on the state senate floor. And there were newspaper wars going on and money being spent on investigative journalism and grand photo essays. For a decade, Molly wrote for the Dallas Times Herald, until it was swallowed up by the Dallas Morning News in 1992. Oh, I envied her, and I am sure that I was not alone  to be a political columnist in that decade before so much of politics turned to spin and pablum. Molly and then Texas Comptroller Bob Bullock (as canny a politician as ever lived), his personnel director Charles Miles and Ann Richards were leaning on the back wall of a popular watering hole during a typical Austin political shindig. A local county official from east Texas, "some old racist judge," as Molly called him, approached. Bullock, who had yet to swear off drinking, introduced the official "to my good friend Molly Ivins." The man was aghast, but he was taken aback further when Bullock introduced him next to his personnel director, Miles, an African American. Then Richards leaned forward, proffered a hand, according to Molly, and said, "How do you do, I'm Mrs. Miles." Laughter as big as Texas  that's what Molly gave us.